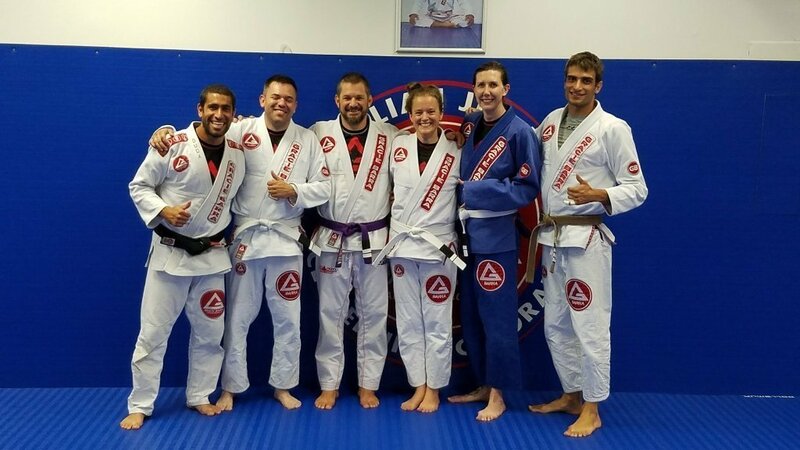 Trying a Jiu-Jitsu class for the first time can be very intimidating. When you walk into a new school the presence of all the skilled practitioners is somewhat daunting. Maybe you have a friend that trains jiu-jitsu or you are intrigued by the use of jiu-jitsu in the UFC. In any case it sparked your interest and you decided to give it a shot. You have called Gracie Barra and spoken to either the Program Director, Professor or Coach to schedule your first class. There are a few options when taking a first class. You can either take a private intro class or jump right into a fundamentals class. Some people prefer to schedule a private trial class. This is a one-on-one session with a Professor or Coach. In Brazilian Jiu-Jitsu a Professor is a Black Belt. It sometimes takes 10 years or more to achieve this level. A few have done it it five or less, but it is definitely not the norm. Coaches are Jiu-Jitsu teachers that have not made the black belt rank yet. They may be Brown, Purple and sometimes Blue Belts. It takes years to reach new levels in Jiu-Jitsu and artists at these levels can be great teachers. The one-on-one trial class gives a great outline of Brazilian Jiu-Jitsu for the new student. You start with a smooth warm-up to get the blood flowing and muscles moving. The teacher then goes through the basics of Jiu-Jitsu self-defense. Many people new to Jiu-jitsu have this impression that it is a fighting/competition art first, most likely due to its prominence in UFC. However, this is not the whole story. Jiu-Jitsu is a Martial Art that focuses on Self-Defense and Self-Improvement. It does have an emphasis on grappling, ground game and submissions but self-defense comes first. The professor starts with some self-defense techniques while standing up. If someone approaches you with a kick, punch or headlock, he/she show you how to stop the assailant from hurting you. Usually they will show you the technique multiple times and then practice it with you. This format allows for a solid understanding of the technique in its raw form and the practice begins the process of developing it into muscle memory. It takes months and sometimes years to perfect a technique, so this is only the beginning. After working on the stand up game the Professor or Coach will begin to teach the ground game. The ground game begins by teaching the guard. The guard is when you are using your legs to block the attacker. Most likely you are on your back with your legs up to protect your body. Closed Guard is when you have your legs wrapped around your opponents waist with your feet locked together. There are many variations of guard you will learn during the journey of Jiu-Jitsu, but closed guard is a staple of the art. For the remainder of the intro class you will see a few more techniques demonstrated and practice them as well. 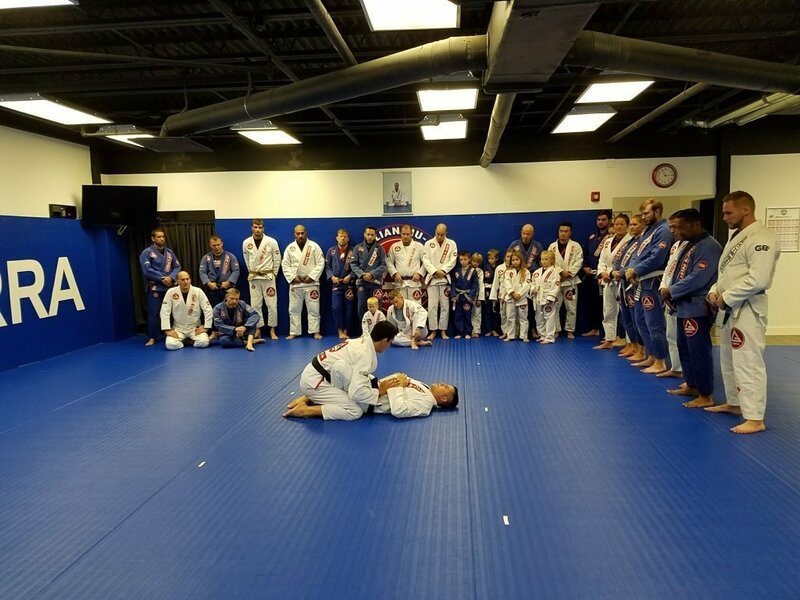 After 30 to 45 minutes you will come away with a clear understanding of Brazilian Jiu-Jitsu and how Gracie Barra Centennial Jiu-JItsu teaches. The other option for a new student is joining a fundamentals class. 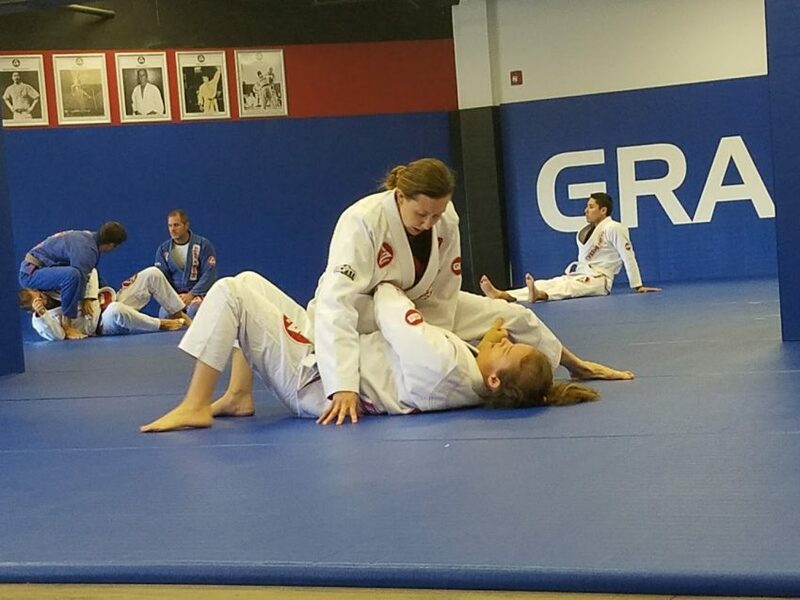 The Gracie Barra philosophy that Jiu-Jitsu is for Everyone sets the stage for each fundamentals class. All are welcome and we strive to make sure each class is safe and fun. 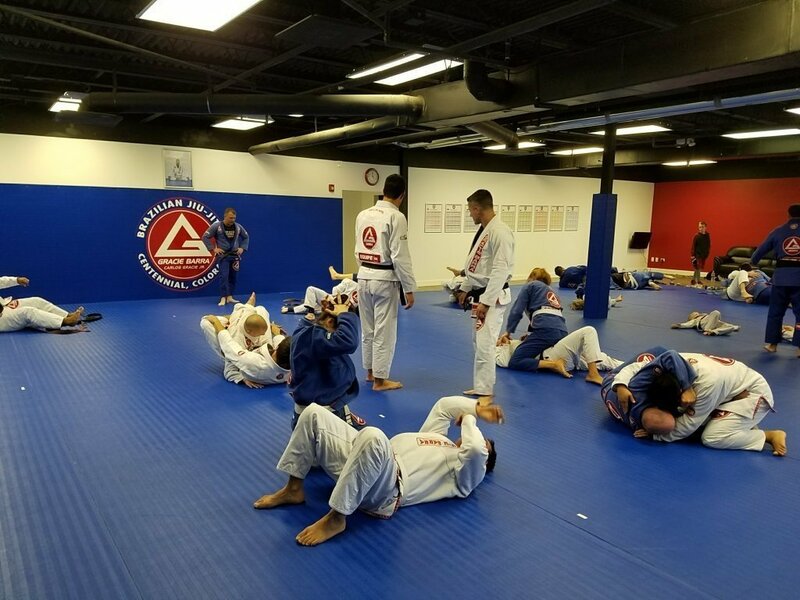 When entering the mat each student wearing the Gracie Barra Gi bows to the center. The Professor/Coach lines up the students in belt order, attendance is taken and class begins with a seven minute warm-up. We go through a series of Jiu-Jitsu centric exercises to prepare our bodies for the forthcoming workout. After the warm-up the Professor gathers the students to teach the first technique. The first technique in each fundamentals class is self-defense. For this article we will reference week 1 of the Gracie Barra Curriculum. Gracie Barra has a 16 week rolling curriculum for the fundamentals class. It was developed under Master Carlos Gracie Jr. with the assistance of numerous black belts. Week 1 Class A self-defense technique teaches how to avoid a straight punch and proceed to a double leg takedown. The professor works with a partner to show the move. He usually does it three times and one in full speed. He gives time for the students to ask questions about it. After showing the technique your real Jiu-Jitsu experience begins. Each student is paired with a partner to practice. Usually new students are paired with a higher belt which helps with safety. We also try to match students with similar heights and weights. The students move to an open space with their partners and begin practicing the moves. While you are drilling professors and coaches are monitoring progress and helping students perform the move properly. After several minutes when everyone has a good understanding and performance of the technique the professor calls all to line up to learn the next move. The second technique for Week 1 Class A is how to pull guard. During this demonstration the Professor executes the technique three times again with his partner. He shows a good way to pull guard to put yourself into a protective and even offensive position. And, once everyone has a clear understanding the students break off into pairs again to practice the technique. Once again professors and coaches watch the students practicing and help them with the execution. After the students work the move a few more minutes they all get a water break and line back up for the third and final position of the day. Right now all these terms may look like Greek, but soon they will become all to familiar. We start specific training in one of these positions. For example we start in full guard. If the student on the bottom in the guard sweeps the top person he advances into mount or guard, he/she wins then you switch starting positions. Or, If the person on top in the full guard passes to a half guard or side mount position he/she wins. Again, we switch positions. This format of training is a great fun and safe way to start training Jiu-Jitsu. You start to learn your body movements in a controlled environment. 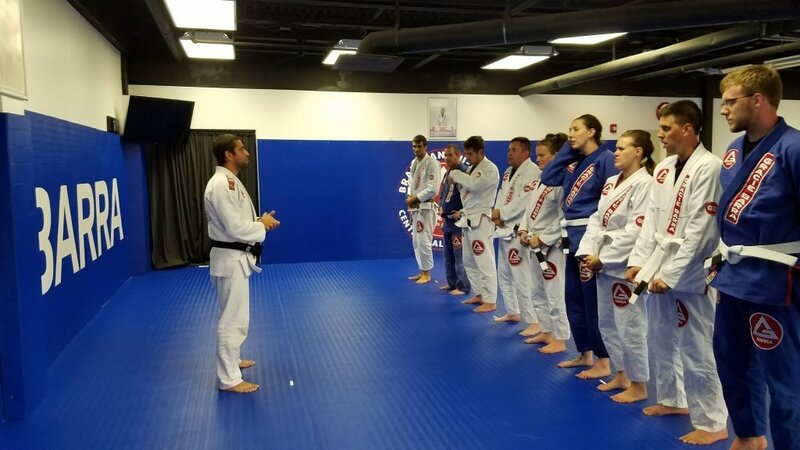 After you have earned your third stripe at Gracie Barra you will move on to live rolling with opponents which can go from 5 to 10 minutes per session. This takes a minimum of four months depending on your attendance and progression. This mandate keeps our students safe and helps add to a lasting Jiu-Jitsu journey. At the end of your first class you will do a series of cool down exercises line up with the class in belt order for the professors final words and announcements if necessary. And, with that one hour you have begun your journey into Jiu-Jitsu.